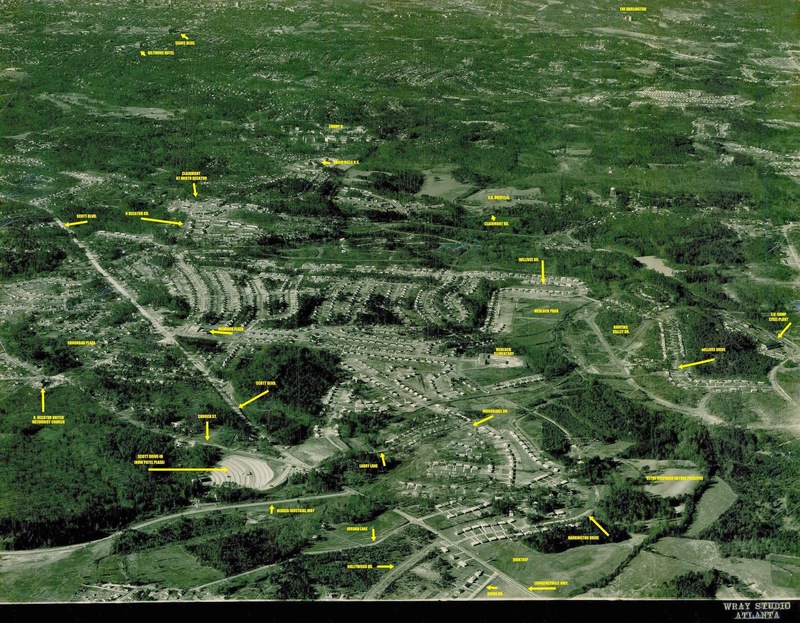 During a recent estate sale, neighbor Greg, the genius behind the Atlanta Time Machine, made one lucky find: an aerial view of the neighborhood taken in the mid-1950's. This is a great addition to our growing "Medlock Time Machine" archive, which now includes neighborhood views from high above, taken in the 1940's and 1960's and the nearby Decatur Waterworks. E. W.: My uncle said when he was a kid he could see Stone Mountain from the top of Vistamont because the trees werent blocking the view. A.W. : ...the same uncle told me that when he was a kid ('50s-'60s), you could look out from Vistamont and see if your friends' bikes were parked by their houses on Ava and Brengare. Our mature plantings weren't mature then. A.W. : ... looking toward the west. Medlock Elementary is the most recognizable structure, just to the right of the center. Medlock Rd. proceeds left from there, and right above there is where Medlock Park is now. The big light-colored space at the lower left is the Scott Drive-In, where Patel Plaza is now. Medlock Plaza and Fountain's are in the photo, as is the Gulf station; Suburban isn't yet. G.G. : ... The road slicing up toward the left hand corner of the picture is Scott Boulevard. You can see the Scott Drive-In movie theatre where Scott turns into Lawrenceville Hwy and DeKalb Industrial goes off to the left. The Patel Brothers plaza is now on the land where the drive-in was (and it was later a Kroger, then a Last Chance Thrift Store). Over to the right of the Scott Drive-In by several hundred yards and a little higher, and you can see Medlock School. A.W. : Does anyone know what the long structure is at the right-hand edge of the photo? G.G. : That's the EV Camp Steel Works plant, located at North Druid Hills Rd, right where N. Druid now crosses over the railroad tracks. It's now the site of an apartment complex. A.W. : My memory only goes back to the '70s, but I think the shops facing North Decatur then were the original ones. The current Melton's used to be a barber shop at the far left, and a hardware store in an L-shape to the right and behind it. Pet Supermarket was an appliance store, and at the far right was Stacy's Pharmacy. I think there's always been a laundromat where there's a laundromat now. I'm, pretty sure Pinckard Cleaners was an original, but I don't remember what else was on the Medlock Road side. The Woodshed, empty space on this photo, was the original location of Your DeKalb Farmer's Market. I can still remember how that smelled. Before that, it was a roller rink. I don't know if it was anything before that. C.N. 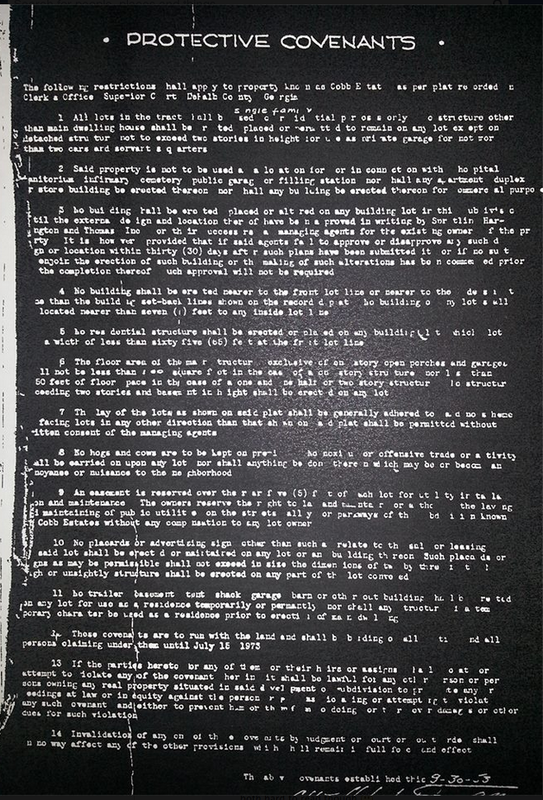 : Is anybody writing this all down? [yes!] I've only been here about 20 yrs, but I remember that the Pet Supermarket space was a pawn shop (maybe All American Pawn?) I think Pinckard must have been original; I remember they had ads saying they had been in business since 1950-something. C.A.B. : Stacey's Drug Store and Pinckard's were there when I bought my house in 1994. Wonder why no one has moved in the old Pinkard's building? A.W. : OMG that smell was so horrible. L.C. : Just above Willivee Place there is a large bright blob. Is that water? That area has Peachtree Creek and Burnt Fork Creek in it. Were they, at some point, dammed to create a little lake? A.W. : I don't know if the smell inside YDFM was worse then than it is now, but the smell outside was definitely worse. A sort of fishy metallic sewage-y smell. C.A.B: eewwww! I'm glad it moved! Looks like there were no houses yet ... on Woodridge. The cul-de-sac had been cleared, but the houses aren't there yet. M.M. : I can see my house from here. It's the only one with a tree on our road! T.M. : Still have that tree...? M.M. : I'm curious how old the trees are in our back yard. We sit above Medlock Park, so have some of that patch of forest that you can see in the pic. Husband guesses it was cleared at some point because our hardwoods aren't as old as, say, Lullwater trees. But it had clearly been replanted and grown up by the '50s. J.C.: I assume this photograph was taken pre-1956 as the area near Schoel/Harrington does not appear to be developed yet. G.G. : I think it's either '54 or '55 (based on a comment elsewhere from a friend who knew the years of construction of a couple of different houses in his family's history, one of which is visible & one of which was not yet built when the photo was taken). C.N. : If I am correct in how I am looking at things, the Medlock Park baseball fields are not there yet but the land is open? Or am I looking at it wrong? G.G. : yes, that photo's definitely a treasure for those of us in the neighborhood, glad you're enjoying. And you have your bearings straight w/ regard to Medlock Park (cleared land, no baseball fields). Just beneath it is Medlock Elementary. C.H. : Seeing the Burnt Fork Creek impoundment is really cool. I always wondered how far back into the woods that 'lake' went before they dynamited the dam. B.B. : At Medlock Plaza, the original business before the roller rink was a bowling alley. G.G. : After zooming in on the Scott / Medlock intersection, I see the original Scott Boulevard Baptist Church 3-story education building, completed in 1953. 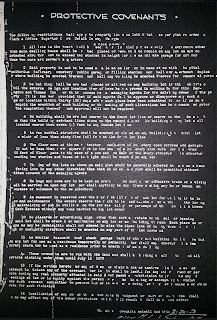 The land for the 1958 Sanctuary has been cleared but the building not built. That would date the photo between 1953 and 1957. In a Facebook discussion last September, neighbor Clarke posted a 1953 building plan for "Cobb Estates" that did not come to fruition. 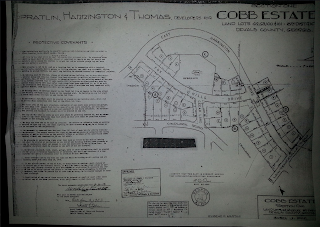 Clark wrote: "This is the original development plat for "Cobb Estates" circa 1953... several things of note are the names for the streets: Wintergreen was Cedar Lane, Woodridge was Medlock Rd. etc. Even Lawrenceville Hwy. seemed to be two-lane and called Lawrenceville Rd. Apparently the lots were twice as big too. A trip back in time... "
At a garden tour years back, a volunteer explained that there used to be a row of cedars leading to the entrance of the Steele-Cobb House (original built in 1855). Some of these cedars still remain near the corner of Fox Hills and Wintergreen.